When the Globe & Mail starts coming out with articles like these you can forget about confirmation bias among the doom & gloomers. Vanblogger I’ve been following your site with interest. I’m a native Vancouverite in my fifties and I’ve owned two homes on Vancouver’s westside, the most recent of which I sold in late 2005 anticipating a correction. 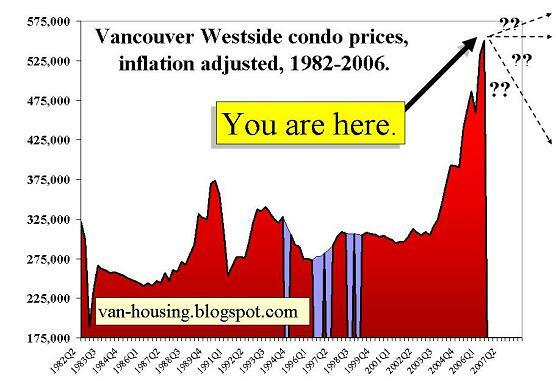 What I find most interesting about comments here and also in the MSM is how little credence is given to Greater Vancouver’s price history since the late 70’s (i.e. the chart at the top of your blog). 1. There have been a number of run-ups in Vancouver, but none more prolonged as this one, and only one more steep. 2. There has never been an instance of a significant run-up followed by a plateau or a less steep upward curve. They have always been followed by a down slope – read, correction. 3. There has never been a correction of less than 15% and its never taken more than 18 months for a drop of this magnitude. Unless we believe that Vancouver can defy gravity or that history is no guide, we are in for a correction, and in fact, we’ve already started. How far it drops will be a function of how far ahead price increases have eclipsed fundamentals. We all know from credible economic reports that this is a very large gap, ergo, the potential exists for a large drop. My own prediction is 20% minimum. Your blog isn’t far from being vindicated and the same applies for real estate cheerleaders in terms of vilification. Here’s a link to the picture at the top of van-housing blogger’s blog. These are interesting times. I’m looking forward to watching what will happen from the side-lines. It’s not even a question of staying out of the real estate market right now because I think they are overpriced or because I think they will crash (which they will). If I walk into a bank today and ask how big of a mortgage they’ll approve me for, I would have to live in a smaller place than the one I am renting now. Even when prices do come down, it still may not be economical to buy for the square footage we require. Bobby, Mozilla or Firefox? I don’t care if it looks funny with Mozilla as it’s not a very common browser anyways.